Digital cameras are incredible devices, able to see and capture things that even the human eye can’t distinguish. On the other hand, our eyes work fluidly and seemingly automatically, while cameras tend to need a bit more instruction about exactly how to function. Once we moved into the digital age, the traditional “aperture and shutter speed” way of thinking about camera functions needed to be updated, so everything was converted into ‘exposure values’, or EV. If you’re more familiar with the traditional camera measuring systems, don’t worry, they work in a relatively similar manner. F-stops and shutter speeds are typically measured in increments of thirds, and EVs work the same way. f/4 is one full step darker than f/2.8 and 1/250th of a second is one step darker than 1/125th, and both are the equivalent of -1 EV. The only odd difference that may throw you off at first when working with EVs is that you don’t bother being so specific as to say -0.33 or -0.66 (1/3rd or 2/3rd of a step), and instead just note these thirds as 0.3 and 0.7. The system was originally developed in the 1950s by Friedrich Deckel, a German camera manufacturer, but it’s only since the advent of digital cameras that it’s really caught on in the photography world. As soon as we started adding automatic functions to cameras like light meters and automatic modes, it became essential to have a digital method of measuring exposures across the 3 point system of shutter speed / aperture / ISO, and Deckel’s EV system was ready for the spotlight. But I Shoot in Manual Mode! For those of you used to working entirely in manual mode, this will probably all be completely familiar to you, and you’ll be wondering when you could possibly take advantage of this. If you only shoot still lifes and landscapes, you may never find yourself in a situation where you need to make use of it, because your scenes will typically be quite static and no rapid settings adjustments are necessary. Even a fast-moving cloudform against a sunset still gives you a bit of time to react and adjust your settings as necessary. But even though shooting in manual mode offers the most control, it’s not always the best solution for every situation. In many cases, you’ll want to achieve a certain specific effect that makes it a better choice to shoot using one of the semi-manual modes your camera offers, typically known as aperture or shutter priority. If you want to stick with a certain aperture to create an appealing depth of field effect or to maintain a wide range of sharpness throughout the image, shooting using aperture priority mode allows you to set the aperture and let the camera handle the rest of the settings. Shutter priority mode works the same way, except you determine the shutter speed and the camera adjusts the rest, which is great for dynamic scenes when you want to freeze motion. But once you’ve started to hand over some of the responsibility for your exposure to the camera’s processor, you may find that it’s not holding up its end of the bargain. Depending on the composition and lighting in your scene, it may overexpose or underexpose your shots consistently. Since you’ve already determined that you want to fix either the shutter or aperture setting, your best bet is to simply instruct the camera to use an exposure higher or lower than what it automatically thinks is best. That way, you can focus on composition and timing without worrying about what your camera is doing. 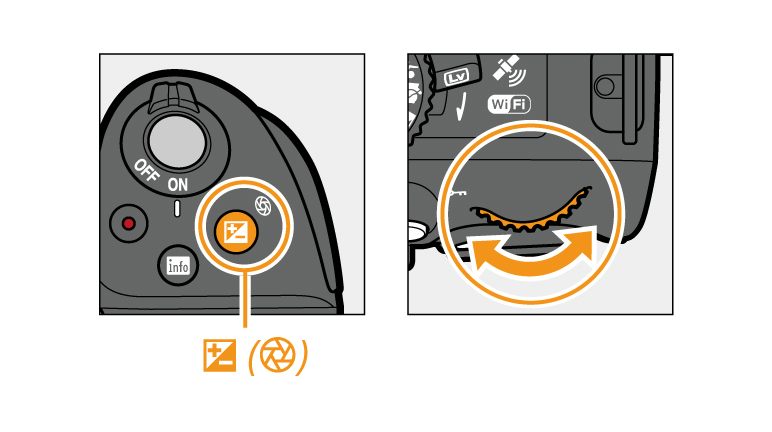 Each camera manufacturer locates their EV compensation button in a different place, but they generally use the same icon (shown below, courtesy of Nikon) which should make it easier to find on your particular camera model. Hold the button down, and then use one of your settings dials to adjust the EV compensation to the desired value. You may be thinking to yourself that you won’t find a use for exposure compensation in your own practice, but there are other ways that it can be of use. Exposure compensation can also be a great shortcut to working with HDR photos if your camera doesn’t have a built-in bracketing mode, or if your bracket mode doesn’t cover a wide enough range. Some bracketing systems only allow for 3 shots, while a range of 5 shots or more can create a much smoother image. Staying in aperture or shutter priority mode, you can simply increase and decrease your exposures using the EV compensation button on your camera to create the required range of exposures. Alternatively, you may find that your artistic sensibilities disagree with your camera’s light meter about what the appropriate exposure value is. Often this kind of problem can be solved by changing the metering mode, but not always. Using spot metering can be a great way to teach the camera’s light meter to avoid underexposing a backlit subject, but sometimes scenes are complex enough that it’s just easier to use exposure compensation settings. One of the best things you can do to improve your photography is to experiment with every possible combination of settings your camera can produce. Be familiar with every capability it has, even if you can’t immediately see how it would help. The more you shoot, the more you’ll realize that there is always another unique situation where that extra knowledge can make the difference between a mess and a masterpiece!